Lamis Deek, a lawyer and board member for the Council on American-Islamic Relations-New York (CAIR-NY), is a self-described "Human Rights Advocate" dedicated to promoting justice and human rights – except when it comes to Israel. 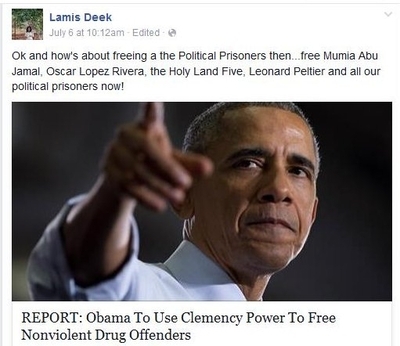 In a response to a report Monday that President Obama intends to grant clemency to nonviolent drug offenders, Deek called on the president to release "Political Prisoners" including convicted terrorist financiers and a convicted killer. "Ok," Deek wrote on her Facebook page, "and how's about freeing a [sic] the Political Prisoners then... free Mumia Abu Jamal, Oscar Lopez Rivera, the Holy Land Five, Leonard Peltier and all our political prisoners now!" Those named share an iconic status within the far Left. Two, Leonard Peltier and Mumia Abu Jamal, are convicted killers. Abu-Jamal, a former member of the radical Black Panther Party, was convicted in 1982 for killing a Philadelphia police officer. In 2012, Abu Jamal lost his last legal appeal after the Pennsylvania Supreme Court rejected a challenge concerning forensic evidence surrounding the case. The "Holy Land Five" refers to five officials from the Richardson, Texas-based Holy Land Foundation who were convicted in 2008 of illegally transferring over $12 million to Hamas, a designated terrorist organization committed to attacking Israeli civilians and the destruction of the Jewish state. "The purpose of creating the Holy Land Foundation was as a fundraising arm for Hamas," U.S. District Judge Jorge Solis said before sentencing the five to prison terms ranging from 15 to 65 years. Supporters continue to describe the five as victims of overzealous post-9/11 prosecutions who simply raised money for deprived Palestinians, and were never connected to any violence. However, evidence and testimony presented at the trial showed the HLF sent money to Palestinian charities under Hamas control. In addition, HLF and its leaders were part of a secret Hamas-support network in the United States created by the Muslim Brotherhood. Internal committee documents show that the Palestine Committee was designed to serve Hamas with "media, money and men." Deek's support for the Holy Land defendants is perfectly consistent with her general position on Israel. When it comes to Israel, Deek's human rights advocacy turns into vociferous hate for a nation and people. She does not shy away from propagating her belief that Israel should cease to exist. In a Twitter post last month, she wrote, "No impunity, ears to the ground, eyes on creative ways to weaken the genocidal zionist regime..."
It's an ironic statement, given that Deek has voiced support for Hamas. In its charter, Hamas calls for genocide against Jews and for Israel's destruction. During the 2012 war between Israel and Hamas, Deek tweeted that Gaza is a "beacon of resistance, exposes shackles, awakens dignity, inspires revolution, reaffirms our oneness – the reason 'israel' won't last". During a 2009 fundraiser for an effort to break Israel's embargo against the Hamas government in Gaza, Deek explained that Palestinian support for Hamas is a choice for "one united Palestinian state on all of the 1948 territories from the north to the very south. That is what Palestinians chose. And in supporting Palestinian choice we are saying we support their right to liberation from violent colonialism." By openly calling for pre-1967 Israel's destruction, Deek's anti-Zionist views transcend into the realm of anti-Semitism. Last August she posted photos on her Facebook account glorifying terrorists from the Al-Quds Brigades – the military wing of the Palestinian Islamic Jihad (PIJ) terrorist organization that has directly participated in the systematic murder of Israeli civilians since the 1990s. Deek is hardly alone in her hatred for Israel, and the resulting American Islamists' rationalization of terrorist violence. Fellow CAIR officials Hussam Ayloush and Zahra Billoo have equated Israel's army, the IDF, with the marauding barbarians of ISIS, who post grisly videos of their creative methods to kill anyone who crosses their path. Billoo did it again June 16, in response to an article about Westerners who join ISIS, under a headline wondering whether they were criminals or victims. "Are westerners who go to fight for the Israeli Defense Forces victims, or racist, apartheid promoting criminals?" she asked. 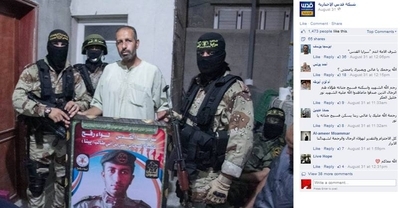 A previous post expressed more fear of the FBI and the IDF than of ISIS. 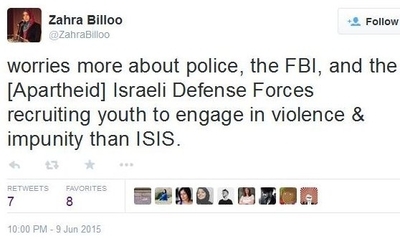 She has also spread blatant lies about Israel's involvement in U.S. law enforcement community engagement. In 2012, Deek spewed ridiculous conspiracies of the Israeli Mossad posing as FBI agents in America seeking to entrap Muslim Americans during a "Know Your Rights" presentation at a CAIR leadership conference and chapter banquet. "It was discovered or published that a lot of the interviews that Muslims believed they were going into with the FBI, it turns out it wasn't with the FBI at all ... Guess who it was? Mossad, Israeli intelligence in New York and New Jersey," Deek said. Deek's desire to see an existing nation destroyed and her moral support for Hamas speak volumes about her "human rights" priorities. It's one thing to advocate for Palestinian nationalism and ways to improve Palestinian lives. But when that position is based on blind hate and the embrace of a terrorist organization which rejects a peaceful settlement and devotes itself instead to death and destruction, she loses any moral high ground and should lose all credibility.